Eye Deal Optical can fit and supply most types of contact lenses including Soft and Gas Permeable lenses. We supply the latest and best quality contact lenses from all of the major manufacturers. Modern contact lenses are very comfortable to wear and most people cannot feel the lenses when they wear them. They are a great alternative to glasses and we regularly fit and supply contact lenses for people of all ages, whether they are worn all of the time or just for occasional use when playing sports for example. Contact lenses sit on the surface of the eye known as the Cornea. In order for a contact lens to be worn comfortably and safely it must fit correctly. Everybody’s eyes are shaped differently and therefore the right contact lens must be selected in order to be worn safely. A badly fitting contact lens can cause blurred vision, discomfort and damage to the eye. In order to select the right contact lens for your eyes you will need to book an appointment for a contact lens trial with our Optician. 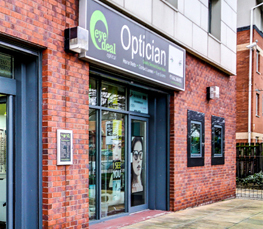 During this appointment our Optician will discuss your needs with you and will then suggest the best contact lens that suits your requirements. Our Optician will then take a look at the front of your eyes and also measure the shape of your Cornea using a machine known as a Keratometer. This will allow us to determine whether you are suitable for contact lens wear and will also allow us to select a contact lens that will fit correctly. Our Optician will then order some contact lenses for you to try. When they arrive you will be invited back to try them. We will check to make sure that they fit properly, that they are comfortable and that you can see properly with them. Finally we will teach you how to insert and remove your new contact lenses and how to look after them before you take them away for a trial period of 2 to 4 weeks. After you have tried your contact lenses for 2-4 weeks you will return for a final ‘aftercare’ appointment. During this appointment we will take another look at your eyes to make sure that there are no problems and make any tweaks if needed. You will then be issued a final contact lens prescription which can be used to order lenses as you want them. An up to date glasses prescription is needed to wear contact lenses so you will need to have an eye test if you are due one. Existing contact lens wearers are welcome to join our Contact Lens Scheme and enjoy its benefits if you already have a valid glasses and contact lens prescription. We may even be able to upgrade your lenses to something better.